Geek Grotto - Get Your Geek On! : Yaiba: Nija Gaiden Z Has A Release Date! 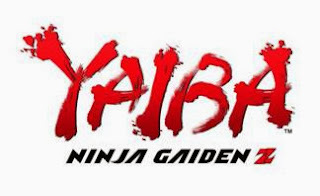 Yaiba: Nija Gaiden Z Has A Release Date! And that date is March 4, 2014! BURLINGAME, Calif. – OCTOBER 31, 2013 – TECMO KOEI America and Team NINJA announced today that YAIBA: NINJA GAIDEN Z will launch in North America on March 4, 2014 for the PlayStation®3 computer entertainment system, Steam® (PC) and Xbox 360® video game and entertainment system from Microsoft. Additionally, a new trailer has been released, introducing Miss Monday, YAIBA’s in-game tour guide, as well as offering an in-depth look at how Yaiba’s newly implemented skills will deliver increasingly gruesome kills. YAIBA: NINJA GAIDEN Z will be available for the PlayStation®3 computer entertainment system, Xbox 360® video game and entertainment system from Microsoft and Steam® (PC) March 4, 2014. This title has not yet been rated by the ESRB.